Elsa is seven years old and different. Her grandmother is seventy-seven years old and crazy. Standing-on-the-balcony-firing-paintball-guns-at-men-who-want-to-talk-about-Jesus-crazy. She is also Elsa's best, and only, friend. At night Elsa runs to her grandmother's stories, to the Land of Almost-Awake and the Kingdom of Miamas. There, everybody is different and nobody needs to be normal. So when Elsa's grandmother dies and leaves behind a series of letters apologizing to people she has hurt, it marks the beginning of Elsa's greatest adventure. 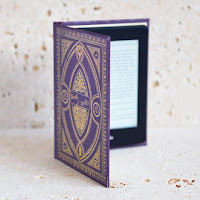 Her grandmother's letters lead her to an apartment building full of drunks, monsters, attack dogs, and totally ordinary old crones-but also to the truth about fairytales and kingdoms and a grandmother like no other. 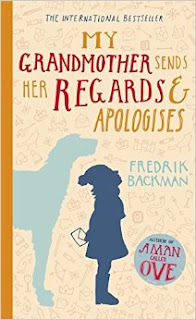 My Grandmother Sends Her Regards and Apologises is told with the same comic accuracy and beating heart as Fredrik Backman's bestselling debut novel, A Man Called Ove. It is a story about life and death and one of the most important human rights: the right to be different. This was utterly charming and quirky. Elsa is almost eight years old and she has a very close relationship with her Grandmother. Granny is hilarious, she does whatever she pleases - from dropping water bombs off her balcony to throwing monkey poo at policemen. I was quite sad when she died but we still get to hear of her escapades through the stories Elsa is told. There's a really funny part when Granny goes to see Elsa's headmaster as Elsa has been caught fighting with a boy. The headmaster tells Elsa to apologise even though the boy picked the fight with her and this is like lighting Granny's blue touch paper! It reminded me of my own Nanna, she would have picked up the globe and thrown it at the headmaster! She was provoked...she couldn't control herself. I loved the way Elsa gave cars names depending on their make - Renault, Kia, Audi and even Taxi. It's almost like she felt they were a part of her family. Her family that is about to grow as her Mum and step-Dad are having a baby - a half sibling for Elsa who she refers to as Halfie. After Granny dies, Elsa goes on a kind of treasure hunt (with a wurse and a monster, no less) which has her delivering letters to people in her block of flats. Each letter contains an apology from Granny and each recipient has a story about Granny and what she did for them. As Elsa gets to know the people in her block of flats we can match them to characters from the fairytales that Granny told her and by the end I had a real sense of community and thought the block of flats was indeed a fairytale castle. This book is a must read for old and young alike. It shows us that it's ok to be different and if a boy tries to fight you, just kick him in the fuse box!